« Every picture tells a story!! When the Coupeville High School boys basketball program unexpectedly ended up with enough players to field a C-Team this year, in addition to varsity and JV, the powers that be had to do a last-minute scramble. And while they did pull together an eight-game schedule against all odds, they also had to nab whatever was available. Which is why a very raw Wolf hoops squad, repping one of the smallest 1A schools in the land, faces a formidable road. We’re talking two games against 4A Mount Vernon, two against 3A Oak Harbor, three against private schools King’s and Cedar Park Christian and one against Granite Falls, a 1A school which used to be 2A until a moment ago. But, while the win-loss record may not end up looking spectacular, the chance for growth, and the response of the players involved, warm the heart of coach Scott Fox. Thursday night the Wolves, an eight-man team heavy in players with limited or no prior hoops experience, squared off with Mount Vernon, and it went about how you would think. Given the chance to play in prime time on their home court, in front of a nice smattering of their fellow basketball players, other CHS athletes, family and friends, they looked tentative at times, and inspired at others. The final score — 51-19 in favor of the visiting Bulldogs — was lopsided, but the Wolves made a sustained offensive run in the first half, and clamped down on defense after halftime, holding Mount Vernon to just 12 points in the final 16 minutes. The visitors bolted out to an 18-2 lead in the first, but Coupeville changed the tone of the game with one play. It came at the very end of the first quarter, with the clock madly racing and the ball loose on the floor. Plucking it from between the legs of two rival players, Wolf guard Jaylen Nitta, the team’s most-experienced player, whirled, bumped a defender backwards, then arced a three-ball high into the air. The orb flew to the ceiling, the buzzer sounded, the ball snapped through the net with a pleasing “splat!” and the crowd of CHS varsity players went bonkers. More than just three points, it sent a jolt of electricity through the Wolves, and they sprang out of the huddle to begin the second quarter with a new look of confidence in all of their eyes. And it immediately paid off. Nitta slapped home a breakaway layup, hauling in a long pass from Andrew Aparicio and beating the Bulldogs to the glass by a step-and-a-half, and Coupeville was off on a 10-6 run. The surge, which lasted through the midway point of the second quarter, included a fall-away jumper from the right side from a fist-pumping Ben Smith and a put-back off of an offensive rebound by Chris Cernick. The lanky soccer ace, a relative newcomer to the hoops world, began to assert himself on the boards more and more as the game played out, something his coach took note of with a nod of approval. For a brief, shining second, Coupeville had the deficit down to 12, had the Bulldogs on their heels, and were flying high. And then reality stepped in for a bit. The much-more polished Mount Vernon squad, which featured a group of freshmen who looked like they had all been ballers for multiple seasons, ripped off the game’s next 21 points. Not that Coupeville didn’t get its licks in, though. 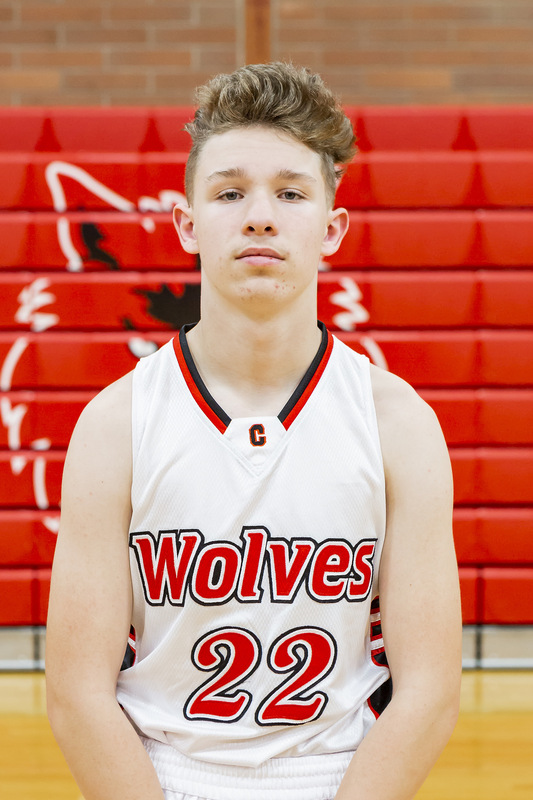 Both Cernick and Smith added put-backs for buckets late in the game, Damon Stadler scored the game’s final basket by muscling his way through the paint, and the young Wolves had a few defensive gems. Smith rose to the ceiling to swat away one shot, Brayden Coatney ran down and utterly demolished an unlucky Bulldog while in pursuit of a steal, and budding enforcer Tony Garcia made sure the Mount Vernon players felt every foul deep in their bones. And then there was Jonathan Partida, who became a legend with one play. The arguably most-talented player on the Mount Vernon roster had a breakaway, with a clear path to the glass and no one in front of him. What he didn’t see was Partida, who was flying from behind, head up, fire in his eyes and muscles bunched. Elevating at the last second, he flung out his arm while airborne and rejected the layup attempt from behind, catching nothing but ball and hammering it off the back wall. It was a beauty of a play, at any level, and a testament to the heart displayed by the Wolves as they scrap towards the promised land. Nitta paced the Wolf attack, rattling home eight points, while Cernick (5), Smith (4) and Stadler (2) also etched their names in the score book kept by former Wolf hoops star Jordan Ford.